PBES are structural components of a bridge that are built offsite, or near-site of a bridge and include features that reduce the onsite construction time and the mobility impact time that occurs when building new bridges or rehabilitating or replacing existing bridges relative to conventional construction methods. The prefabricated structures are built off-site and outside traffic areas. They are then carefully transported to the site where they can be installed rapidly. Milbocker only installs prefabricated structures, we do not sell them. 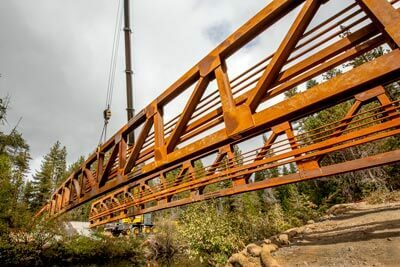 PBES (Prefabricated Bridge Elements and Systems) are key enabling technologies that Milbocker & Sons uses to reduce overall project delivery time through ABC (Accelerated Bridge Construction). Bridge projects that have historically created traffic congestion for one, two or even more construction seasons can be done, if prefabrication opportunities are taken, in such a way that traffic disruptions can be minimized to weeks or even weekends. The use of prefabricated bridge structures is so effective that although conventional construction methods, such as cured-in-place concrete, will continue where appropriate, they will no longer be the methods of choice. To learn more about Milbocker & Sons, Inc. Professional prefabricated structures installation for your next Michigan project, or to request a quote, contact us here or call us directly at (269) 673-2195.